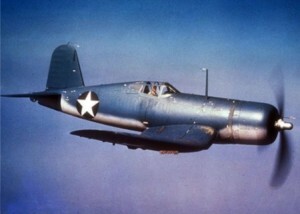 On the morning of May 23, 1945, a civilian test pilot took off from Bridgeport Airport in Bridgeport, Ct., in a U. S. Navy F4U-4 Corsair, (Bu. No. 81778), for a production test flight. At an altitude of 12,000 feet the engine began to misfire, and the pilot radioed that he would be making an emergency landing at New Haven Airport. At approximately 3,000 feet, and while making a turn to begin his final approach, the aircraft caught fire and smoke and flames began to fill the cockpit. While attempting to turn off the fuel selector valve the pilot received minor burns on his left wrist and both ankles. At 2,000 feet the pilot bailed out and parachuted safely, coming down in the middle of a creek. He was assisted from the water by some local residents who took him to New Haven Airport where he was treated for shock and minor burns. Meanwhile, the unmanned aircraft crashed 75 feet from a home in the area of 263 Short Beach Road in East Haven. There were no injuries to those on the ground, but the plane was completely destroyed. Source: National Archives, ATR-1 (revised), TD450525CT, via Larry Webster, Aviation Historian, Charlestown, R.I.